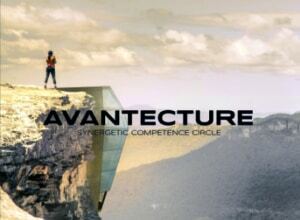 AVANTECTURE jointly develops with you an innovative office building in a modern architectural style. Our synergetic team of experts from various disciplines designs, plans and realises a new creative world for your company. The architectural language defines the image and the corporate culture on a whole new level. 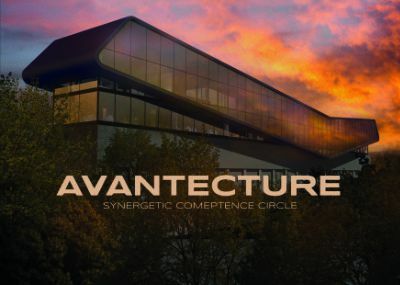 Building an office building with AVANTECTURE – this means rethinking in all directions, starting with the form language and floor plan, up to the state-of-the-art building services and furnishing concepts. We plan project-oriented with minimal overlaps and high competence in cost calculation. The right building structure raises hidden potentials in the productivity of your employees and thus the effectiveness of the entire company. The architecture of an office building sustainably defines the image and corporate culture. ˆ above: modern office building with approx. 400 sqm office space and a 300 sqm warehouse. The warehouse has been unobtrusively integrated into the architecture of the building on the street side, does not disturb the design language and has a visually enlarging effect. The company building was realised as a solid construction with modern building services. ‹ left: avant-garde company building with large warehouse behind it. The iconic design language symbolisesr an innovative company from the solar industry and is a real eye-catcher next to the motorway. It will be constructed as a solid building with an elaborate supporting steel structure. The right building structure & construction method increases the effectiveness of the entire company. 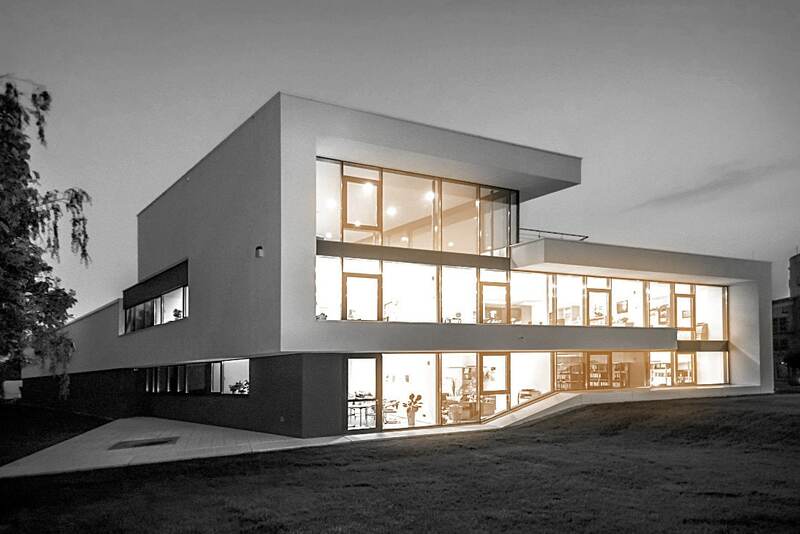 This design of an office building was created to show our customers that even such a commercial building can embody modern and avant-garde architecture in high quality. Impressive overhangs, strong entanglements and the interplay of glazing and closed wall surfaces – only interrupted by horizontal light slits – characterise this building – best suited for a companies headquarter with the desired highly progressive expressiveness. Have we aroused your interest? Then please contact us! We are looking forward to your extraordinary project and would be pleased to visit you for a non-binding planning consultation. Upon request, you will receive our image brochure with further information and reference projects not shown on the web as PDF. 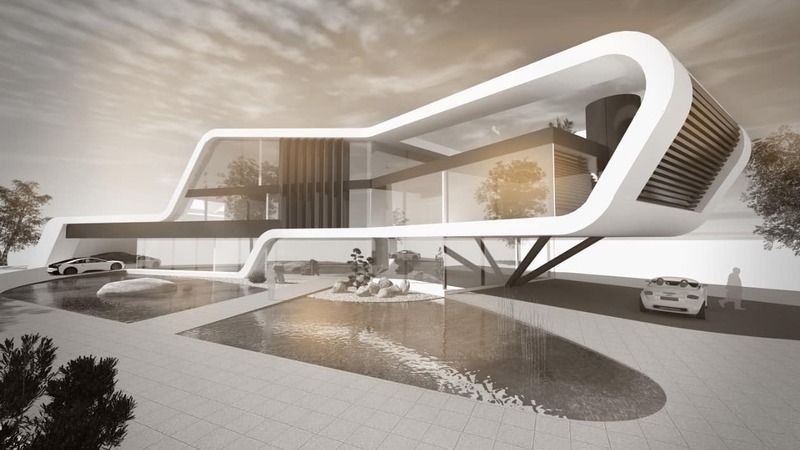 Energy and building service concepts for the office building of the future. Implementation of the corresponding specialist planning for an economical operation of the future company building. Networking of required competences for complex projects. Integration of appropriate partners for industrial construction, commercial construction and hall construction. Rigorous management of deadlines & quality on site on behalf of our customers.